Another tasty space opera treat from the book universe. Victoria Marin, privateer and captain of the salvage spaceship Condor, is in the red and in danger of losing her ship if she can’t locate fresh salvage and bring home some new xenotech for profit. It seems too good to be true when her crew catch a distress signal in nearby space. What she finds there, though, is a drifting wreck and an inconvenient survivor – First Prince Tavram, heir apparent to one of the largest and most powerful empires in known space. And there’s a deadly, powerful warlord from an opposing empire hot on his trail. If there’s one thing you need to know, it’s this: Devil’s Daughter reads closer to Christian fiction than Urban Fantasy. While the story takes some liberties with the religious mythology, it stays true to its themes of redemption and love, what it means to be a good person, the danger of good intentions and shortcuts, the power of choice. You know, the works. “Lucinda is as old as humanity itself, yet perpetually young, beautiful, and endowed with supernatural powers. She lives a double life human and immortal. 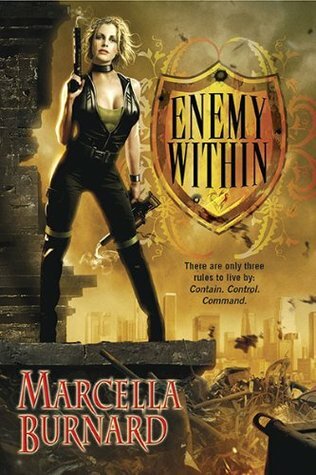 After reading that blurb, you’ll be forgiven for thinking this story is all about Lucinda’s struggle against Lucifer and quest to figure out where she stands, all culminating in a grand standoff during which she singlehandedly saves the world. When I first launched theCanaryReview a few years back, I was going to make it a blog dedicated solely to space opera books. Then, I realized I’d never be able to sit still within one subgenre. But I still love them. And so I bring you a couple more fun reads from this delicious sci-fi romance gene. Captain Ari Rose is the only person to survive being a prisoner of war of humanity’s alien enemies. Ever. Stripped of her command and banished to her father’s scientific expedition to finish a Ph.D. she doesn’t want, Ari wonders why she bothered to survive. But when pirates commandeer her father’s ship, Ari once again becomes a prisoner. It’s been a while since I’ve read steampunk. The historical aspect of the genre usually keeps me away. But when I saw Dogwood Sprocket’s pretty cover, I couldn’t say no. The Story I Ended Up Reading. Cuz Cover. Just look at the shiny silvery stuff. Just look at that top hat. It’s the year 2287, and Grace York makes a living hand-crafting clever mechanical collectibles in an age of fast flying cars and soaring skyscrapers. 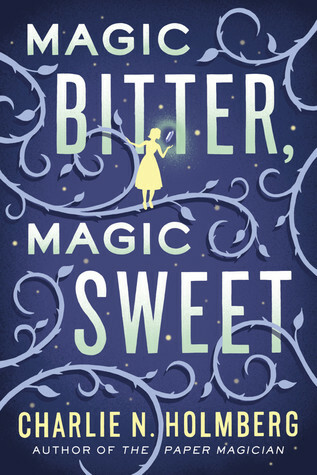 Her life is interrupted when she is sucked through a mysterious portal created by Hugh Hawthorne, a clever inventor from a different time and a different, parallel universe. As Grace tries to adjust to the new, mechanical, steam-powered world, she finds herself falling for Hugh, a man who might be lying about whether he can get Grace home again. Some stories make me angry. Some make me want to call all my friends to rave in delight. And some – the hardest to talk about – land somewhere in the lukewarm middle. This is that kind of story. 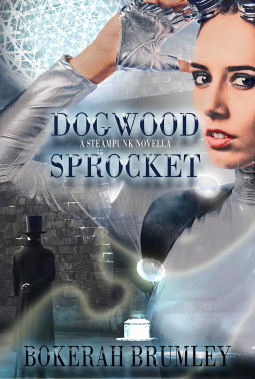 Dogwood Sprocket is like curling up with a mug of tea on a comfy. It’s pleasant, cozy and sweet. It doesn’t thrill, but neither does it disappoint. It’s nice. It’s a neat mix of time travel and romance. The first sparkle of romantic connection is instantaneous when the characters meet, but Grace and Hugh slowly and tentatively build their rapport over the full course of the story. Luckily for Grace, her futurist career as a toy-maker and artisan is probably the only job whose skills transferred perfectly and immediately to a steampunk world. Grace’s independence is a lovely foil for Hugh’s cautious courtship as they navigate tricky issues like Victorian Era dress codes, a formal outing, how to get Grace home again…and what to do once she gets there. Oh, and there’s a cute cat. All and all, the short story is a nicely-crafted ode to the steampunk genre. I received a free copy of the story for review. Famous last words, right? 275 words later, I’d polished off this clever fairy-tale and it was way past my bedtime. Here’s the setup: Maire lost her memory four years ago but managed to make a life for herself in a small town. Then she loses her bakery. Then her family. Then her freedom. As a slave to a deranged master, the only thing Maire has left is her mysterious ability to infuse her cooking with her magic. The ante goes way up as her new master forces her to use her magic for evil purposes. Add in a winged spirit-creature and maybe-lover, lots of gingerbread, vicious marauders, escape attempts and cosmic creation. With a bakery set-up (and the girly cover), I was expecting chic-flick lite – something whimsical and dramatic and funny. But the story was darker, deeper and more mature than I expected, certainly far from humorous. It moved between themes of compassion and forgiveness to real moments of bleakness despair. Everything that happens in fantasy adventure happened, but with a this is real life, and it’s not always pretty turn to it. 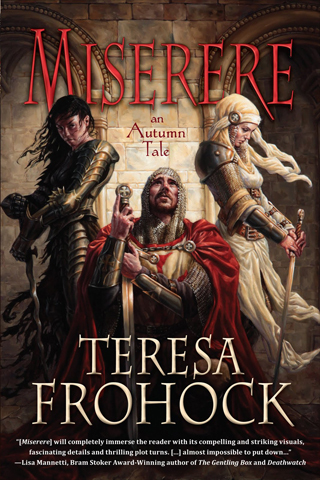 It was an odd and clever combo of low fantasy grit and lovely fairy tale. We follow resilient, strong-hearted Maire through her trials. It’s a spark of Cinderella minus prince, with a dash of amnesia, a sprinkling of abduction and torture, with a side helping of a strong current of importance-of-family. Think: a grittier Robin McKinley. That said, in an odd way, things came both too hard to Maire, and too easy. What could have had simple answers, took the entirety of the book. When the book decided to be hard on Maire, it didn’t do things halfway. The mystery kept me reading, but I figured a bunch of things out way ahead of the big reveal, so there wasn’t much to feed the mystery-guesser in me until the very, very end. Overall, I’m of mixed opinion on the story. It’s a cool story that explores some pretty dark and deep places. But…Take all that together, give it a shake, and you get a canary rating that’s a bit mixed. I’d recommend this to anyone wanting traditional fantasy + romance lite + a smart, mature character with a Jane Eyre level of compassion in the face of suffering. Book provided by publisher in exchange for an honest review. When it comes to gorgeous covers, I am helpless to resist. Here’s a book I picked up based off on cover art alone. Blurb? Story? Psh. The Book I Ended Up Reading. Cuz Cover. The Plot: In a purgatory-style world that exists as a war zone between our world and Hell, demons walk the lands and the prayer has power. When exiled exorcist and ex-holy knight Lucian Negru refuses to help his sister’s takeover plot to release demons upon the lands, she imprisons and cripples him. Lucian escapes and uses his powers to open a Hell Gate to save the soul of an innocent, breaking the conditions his exile. That sets him on a collision course with Rachael, the lover he betrayed and abandoned to die in Hell years ago and who is tasked on finding Lucian and bringing him to justice. At the same time, his power-hungry sister will stop at nothing to have him broken and back at her side. Impressions: Pleasantly surprised! Torment, angst, and redemption? Oh yes. This book hit just the spot. What makes this even better is that though we have uber-tormented and scarred characters, they also come with a healthy dose of matureness, self-aware in a lot of decisions they make. It’s a really nice change of pace. A super sweet story steeped in violence and darkness. The initial premise reminds me of The Curse of Chalion lite. The minuses? Predictability and a simple plotline that I didn’t really mind. 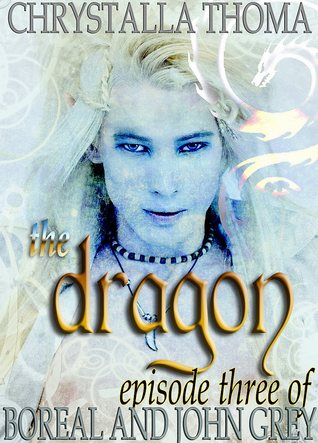 I’ve been starved for an easy fantasy+romance combo read, and this delivered. Have you had covers that put books on your read shelf?